Australian sailors have made a winning start to the 2012 Skandia Sail for Gold Regatta in Weymouth, England, as light conditions made for an exceptionally long day. 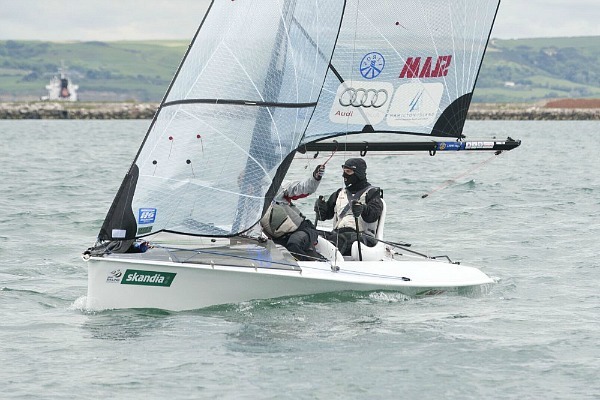 The ISAF Sailing World Cup round is the last hit out in Weymouth before the London 2012 Olympic and Paralympic Games with four Australian crews beginning their final run to the Games in style with race wins. Price and crew sailed exceptionally well in the light and tricky conditions with the Australians scoring wins against a number of higher ranked crews, including reigning World Champion, American Anna Tunnicliffe. Mathew Belcher and Malcolm Page continued their great form from the recent 2012 470 World Championship, winning the opening two 470 men’s races. The pair has won their last six regattas, including two World Championships, with the two race wins on Monday the perfect start as they look for that elusive overall victory in Weymouth. “After being sent out early on for an 11am start we got away on time in quite marginal conditions,” said Belcher. “The wind was very unstable with big shifts and large velocity changes. We just kept our cool and played the cards we had. We saw a small opportunity on the last downwind to catch the leaders after being in fourth at the last top mark and managed to take the win. Fellow Australians Sam Kivell and Will Ryan also sailed well in the light conditions with the pair seventh overall following a sixth and a third with brothers Matthew and Robert Crawford 33rd. Elise Rechichi and Belinda Stowell kicked off their first regatta in Weymouth together in style with an opening race win in the 470 women. Rechichi and Stowell finished fourth in race two to end the day second overall, tied on points with new World Champions Hannah Mills and Saskia Clark of Great Britain. Nathan Outteridge and Iain Jensen are seventh overall after the opening three 49er races, 10 points behind the leading British crew. The current World Champions were fifth in the opening race on Monday morning before being sent back to shore as the breeze died out. After a long delay the fleet returned to the water with Outteridge and Jensen rounding out day one with a second and an eighth, with their final race not finishing until almost 8pm. West Australians Luke Parkinson and Jaspar Warren sit in 28th position. The Laser fleet only managed to complete one race late in the day with Tom Burton the leading Australian in fifth overall. One place further behind is five-time World Champion Tom Slingsby with the pair finishing third and fourth respectively in the opening race. Ryan Palk is the next best placed Australian in 43rd, ahead of Jake Lilley in 75th, Ki-Raphael Sulkowski in 87th and Jared West in 93rd. Jessica Crisp started her regatta in perfect fashion with an opening race win in the RS:X women’s fleet. The triple-Olympian was 12th in race two to be fifth overall. Fellow Australian Joanna Sterling finished the day in 33rd. The Skud 18 fleet completed just one race early in the day with Australians Daniel Fitzgibbon and Liesl Tesch crossing the line second to be in the same position overall. It was a similar story for the Sonar class with just the single race held inside Portland Harbour. Colin Harrison, Stephen Churm and Jonathan Harris were fourth in their first race in Weymouth together as they continue to prepare for the London 2012 Paralympic Games. The 2.4mR fleet were able to complete two races later in the day with Tasmanian sailor Matt Bugg currently sitting 15th overall. Bugg was 10th in the opening race before finishing 20th in race two. The Laser Radial fleet was able to complete two races late in the day with Krystal Weir the leading Australian in 20th. Weir was 15th in race one and eighth in race two, having been named to compete at her second Olympic Games earlier in the day. Alexandra South is 35th overall, ahead of Caitlin Elks in 59th and Ashley Stoddart in 66th. Brendan Casey finished the day’s one and only Finn race in 36th to be in the same position overall. In the RS:X men’s class Queenslander Luke Baillie is 50th following a 55th and a 45th.